I broached this culinary ordeal with vivid memories of a long-ago soy sauce tasting from which I'd emerged with comically useless notes reading "Salty!" "Very Salty!" "Salty!" and "A little less salty!". A massive tasting of granolas seemed likely to evoke a wash of similarly undifferentiated impressions - this time, of endless roasty/toasty/raisiny/nuttiness. But I forged on, curious to investigate my theory that granola is in the midst of a renaissance, evolving from insipid health food cliché into something more resembling luxury food. For one thing, there are the prices, which have skyrocketed since the days when granola was a generic commodity careening into sturdy paper bags in the back of dank, sanctimonious natural foods stores. The most expensive granola at our tasting, the preciously wrapped E.A.T. Original Granola by Eli Zabar, sells for a mind-boggling fifteen bucks per small one pound package. Many of the rest cost $7 or $8 (plus another $5-7 for shipping; mail order's the only way to score most of these brands). My attention was first captured by obscure Ola! Granola. I'd ordinarily hesitate to pay $6 for 9 ounces of roasted grain, but upon cracking open the package I found myself powerless to stop munching. I scarfed nearly the whole bag, dry, in a violent spate of rapid-fire ingestion, leaving a light wake of oaty dregs on the floor under my frantically shoveling hand. Not that it was so sublimely delicious. It was, to be sure, damned good granola, but it was more addictive than aesthetically perfect. 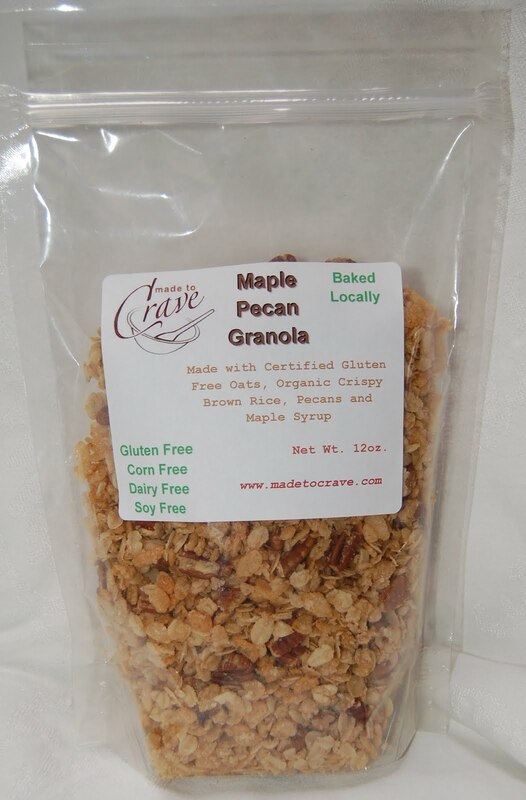 I'd never before encountered an addictive granola. 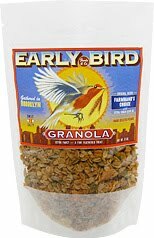 Then I stumbled upon Early Bird Granola, which was downright torrid. 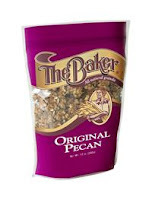 This product is so assertively sweetened that it'd be nearly inedible if not for all the mitigating fat and salt and intense flavor blooming this into something eons more richly bodacious than would ever be expected of prim, earnest granola. It's nearly too much for me. But not quite. There's still plenty of old-school granola (few surprises or nuances) being sold, but pressure from all the upstarts seems to be sharpening everyone's game. Quality is skyrocketing. And I smell a burgeoning trend. It was time for a survey. So I gathered 25 products from 15 companies for a gigunda taste-off. Rather than try to match the unmatchable, I accepted that this undertaking would pit apples against oranges (and pecans, cranberries, and crunchy spelt clusters), and embraced the variation. All granolas were tasted "blind" by a panel of twelve tasters. Special thanks to Ray Deter and the staff of Manhattan's DBA Bar (fun fact: hard cider is the optimal accompanying beverage for a granola tasting). Thanks also to Pat, Paul, Dave, Peter, Layne, Vaughn, Sari, Jon, and Lucy, whose palates were keen, opinions insightful, and patience (and eating capacity) plentiful. One of the best tasting groups ever! Opinions and ratings from panel tastings are normally all over the map. But this time, five brands were clear favorites. 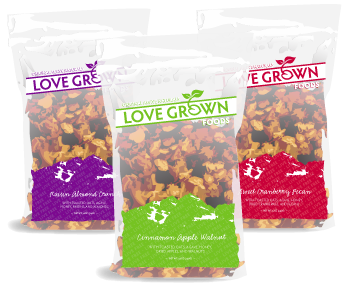 Love Grown Foods: "Sweet Cranberry Pecan"
~The most darkly-roasted granola we tried. Old-school, but awesome finesse. So rich and hearty. Surprisingly tart cranberries! 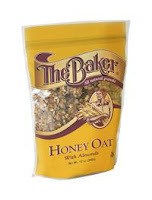 ~Toasty, and the only granola with a really long, seductive aftertaste. Another flavor-packed oily/salty/sweet granola, but not as decadent as Early Bird's. High quality nuts. One of only two granolas with serious depth. 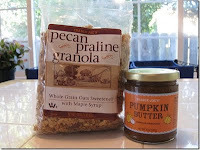 ~This is the granola whose recipe the NY Times published - an instant classic. It's a voluptuary experience; sweet, salty, flavor-packed, and so glisteningly greasy that it almost tastes fried! 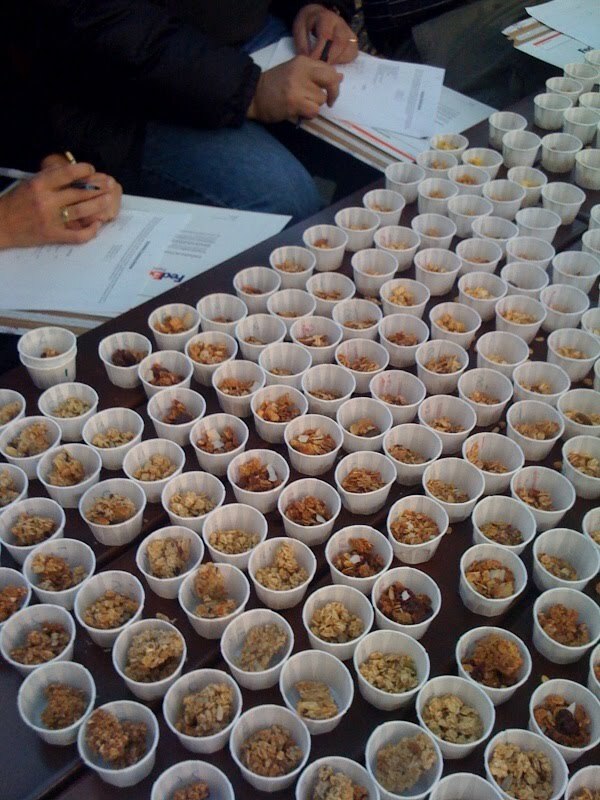 Not for the first time, the panel was moved to ponder how, exactly, one defines "granola". I'd like to have tasted their Aloha (mango and macadamia) and Jubilee (cherry and pistachio) flavors, both of which have their devotees, but was unable to find any. 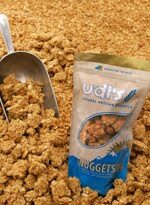 ~Another deep, three-dimensional granola, and a particularly beautiful balance between cereal and add-ins, all of which (especially the sheets of dried coconut and terrific hit of ginger) are of exemplary quality. ~Great texture, very adult, dry flavor and aroma (smells like Korean barley tea). Very crisp yet not greasy. High quality nuts - though it could use more of them. 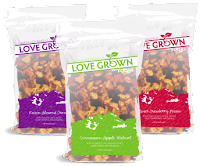 Love Grown Foods: "Cinnamon Apple Walnut"
~Has the aroma of a crusty old Vermont health food store. Classic old-school granola, slightly cloying yet ascetic. The panel loved the spicy/sweet flavor, but some found the bits of dried apple overly chewy. ~Granola-as-Rice-Krispies-treats. Luxurious buttery aroma; refined and restrained grain flavor, optimal salty/sweet balance. This one should probably be eaten dry. ~Good quality cinnamon in perfect proportion. The sweetness is equally calibrated, as is the almost subliminally salty undercurrent. Nothing fancy, but highly enjoyable. ~Not as perfectly balanced as the Vanilla Almond; this one's flavor is a bit mamby-pamby, and the texture was a tad too chewy/sticky for some. Still, two tasters voted it among their top three. ~True vanilla flavor, and a warmly vibrant sweetness skillfully balanced by salt and lots of earthy seeds. 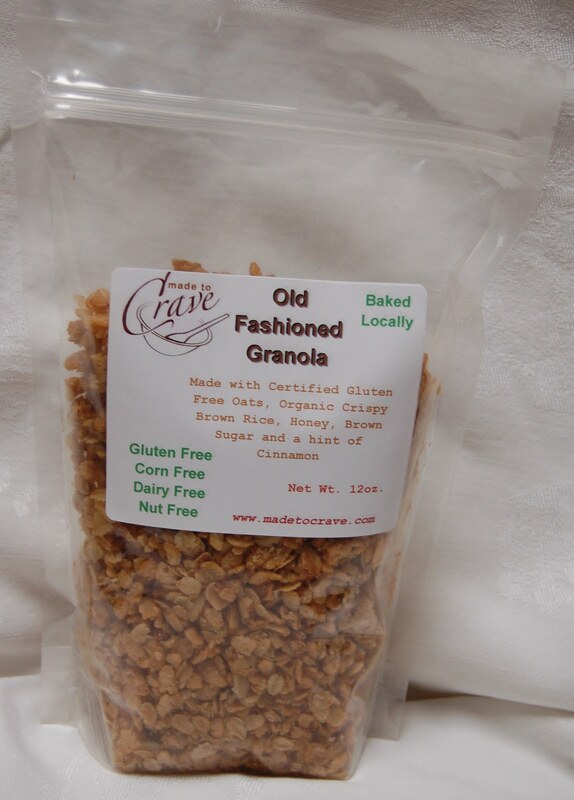 This old school granola, made with a knowing touch, didn't rate particularly well, but it suffered unfairly because we'd only sampled this oddball flavor - and the gripe was that it had so many seeds. I'm betting Back to Nature's more conventional flavors would have showed better. ~Stretches the definition of granola. Really, it more resembles those squiggly, crunchy Indian snack melanges, with weirdly shaped flakes, seeds, and any number of unidentifiable add-ins. The simple sweetness and the fake butter flavor turned off several tasters (one dismissed this as "Buttery Pebbles"). ~A bit less sweet, but still pretty whacky! Divisive! 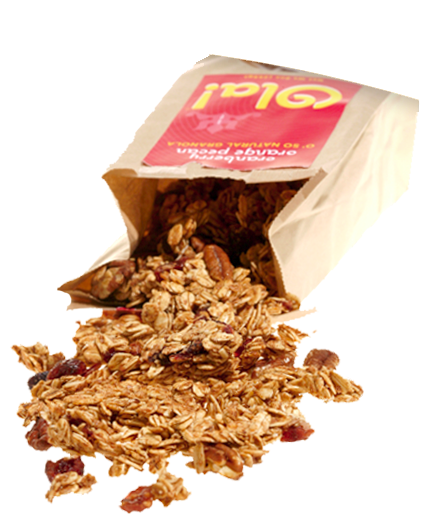 This is a phenomenally quirky granola, with tons and tons of bee pollen, and an almost overwhelmingly complex meaty flavor that delighted some and perturbed others. Unfortunately, it did not survive shipping well, and was reduced almost enitrely to powder. I think this granola would have been more widely admired if its texture was in the proper condition, though a few deemed it irredeemably bitter from the bee pollen and generally overstuffed with non-harmonious ingredients. Still, it was the favorite of one taster, who beamingly insisted that it had "utterly broke through my preconceptions of granola." Udi's, an otherwise exemplary producer, makes one variety which failed to make the top grade. 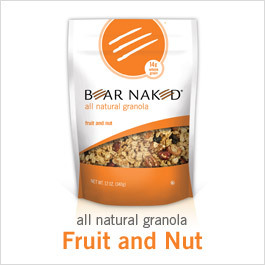 Bear Naked: "Fruit and Nut"
~A classic, clean-tasting old-school granola that's not too sweet or extreme in any way. Excellent balance. No negatives, just not very interesting. 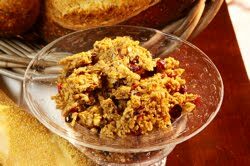 ~Lacks flavor and warmth, especially in the finish, and the dark-hued cereal is surprisingly short on roasted grain flavor. This, the most expensive granola, was favored by no one. ~Nice aroma of quality wildflower honey, but a bit dull. One taster really disliked it, comparing it to "a stale vegan monstrosity cookie from a health food store." 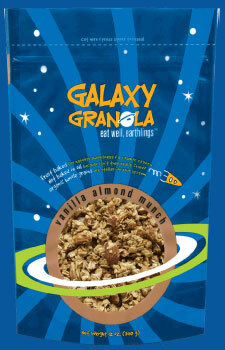 Galaxy Granola: "Not Sweet Vanilla"
~Good balance, but a vaguely prim, spelt-y vibe. 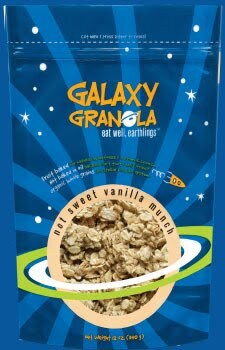 Galaxy Granola: "Vanilla Almond Munch"
~Overpowering marzipan flavor and aroma, like Italian Christmas granola from some alternative universe. We loved the high quality little almonds. Trader Joe's: "Pecan Praline granola"
~Raisiny, simple, little grain flavor, hard yet uncrunchy. Note: everything's relative. The following are actually pretty good, but couldn't compare to some of the more extraordinary products. In fact, while "The Baker" was unanimously voted down, two of our panelists had long deemed them their favorite producer. 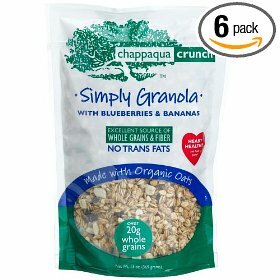 Chappaqua Crunch: "Blueberries & Bananas"
~Again, dull, chalky, and dusty...plus we really disliked the perfumed-up banana chips. 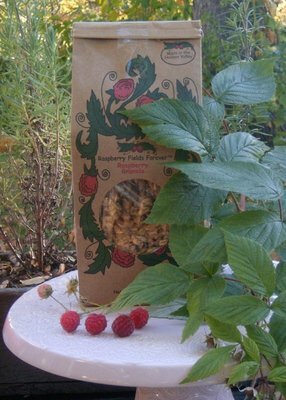 Dorset Cereals: "Fruit, Nut, and Fiber"
Raspberry Fields Forever: "Raspberry Granola"
~The group agreed that this tasted like weirdly soggy hippy pie crust made with marshmallows and cod oil. Not that anyone's actually ever tasted such a thing, of course. The Baker: "Honey Oat with Almonds"
~Overly sweet and undistinguished. Didn't love the chewy texture. 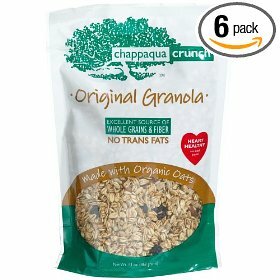 Best chewy granola I've tried. Beautiful harmony, love the ultra-tart cranberries. Flavor like a great oatmeal cookie. Ironically, they also sell oatmeal cookies - which are merely ok! ~Crumbly/chewy, and that's good because there's something about this granola's flavor, with its deep, dark, honeyed tones, that would be lost with a crunchier texture. You want to spend time slowly working on it, extracting and appreciating the wonderful balance. ~Unappealing soggy/soft texture, a bit over-sweetened (and the chewiness concentrates that sweetness on one's palate), and an unsubtle wallop of cinnamon. 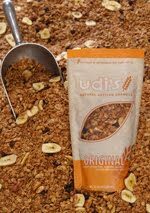 I unfortunately couldn't get my hands on any Lizi's Granola from UK. Jim, great and thorough article! It was fun being part of this historic tasting. 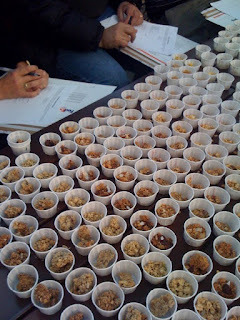 Found a new granola since the tasting, Feed granola (http://www.feedgranola.com). I'm becoming addicted to their Bittersweet-ness which has chocolate but is not candyish. It's of the somewhat healthy variety, but has an unexplainable extravagance. 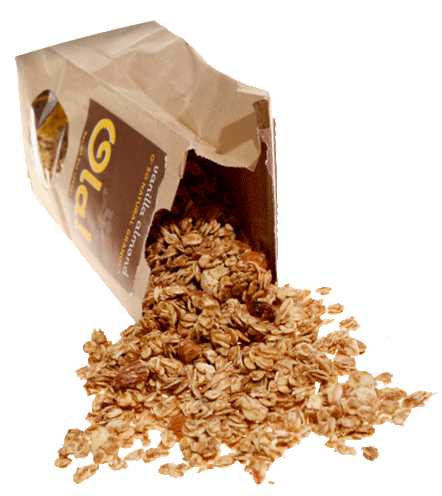 Also Trader Joe's Gluten Free granola looks strikingly like Bakery on Main granola, but has a much nicer price. If you haven't tried them, my two favorites are Kingslake & Crane's granola with cranberries & cherries (at Zabar's) and Metropolitan (from the bakery in Philly, available via mail order). Those are the only two granolas I would actually buy.